Beautiful, intricate pattern exhibited on the gown and enhanced with white and black beaded fabrics. 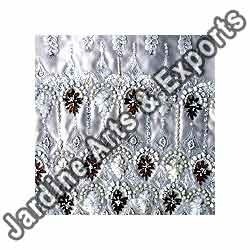 Superior quality satin is used as base and designs that are highly intricate can be seen on the gown. The design promises to be different and unique thus making it all the more desirable. The beads used in the gown are selected with much precision and that is seen in the finish of the design. Looking for Beaded Fabrics ?